Property Description - The condominium is located in the beautiful tropical setting of Park Shore Resort. 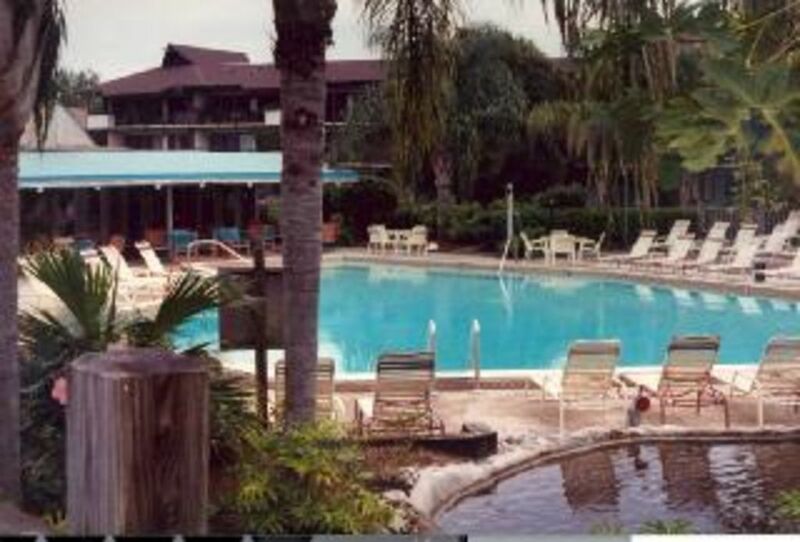 Park Shore Resort is close to the Gulf beaches, just west of Tamiami Trail on the north end of Naples, Florida. Condominium Amenities - This condominium is a large, 842 square foot, one and a half bedroom condominium. The master bedroom is furnished with a king-size bed. The den has a queen-size sofa sleeper and track curtain to convert the den into a private bedroom. The condominium has two full baths. All bedding and towels are supplied. The kitchen has a complete set of utensils, dishes, pots, pans, microwave, dishwasher, and refrigerator. The condominium also has two TVs with cable and a VCR. Resort Activities and Attractions - There is a beautiful waterfall beside the large heated pool, ponds with fish to admire, a Jacuzzi, sundeck, gazebo, and barbecue area with gas grills. For the sports-minded, there are private tennis and racquetball courts. Also, on the premises is the Island Club Restaurant for those nights that you don't want to cook. Five other restaurants, a grocery store, a drug store, and other shops are in walking distance of the resort. There is also a laundry mat located in the resort. See list of Activities below. The beaches are beautiful and they are a short drive or moderate walk from the condominium. Golf-lovers will enjoy Naples. Naples has more golf courses than almost any other city in the world. Condominium Restrictions: Pets are NOT allowed in this unit. NO Smoking inside of this unit. Large 842 square foot 1 1/2 bedroom condominium. The condos’ master bedroom is furnished with a king size bed. The condo’s den has a queen-size sofa sleeper and track curtain to convert the den into a private room. The condo has two full baths. All bedding and towels are supplied. The kitchen has a complete set of utensils, dishes, pots and pans, microwave, dishwasher, and refrigator. The condo also has two TV's with cable, a VCR and DVD player. FREE WIRELESS INTERNET service! also a laundry mat located in the resort. almost any other city in the world.